Summer ministry was busy and blessed in 2018!!! The hot and busy summer months have not adversely affected worship attendance for Bible Family Fellowship. We continue to pack in around 30 people each week (and more during the Texas Team's week of ministry) and we tax the air conditioning to its limit! Honestly it can't keep up, especially when we all begin to worship and sing. So excited to see where and how we will see the effects of the summer outreach ministry. Waiting and watching for the Lord to do what only He can do! As is the case every year, the Texas Team went above and beyond to help us execute an excellent week of outreach and ministry. We can never express our thanks in words for how year after year they bring such blessing with the work they do to make the first week of Summer vacation an intense week of outreach and ministry. As usual we began the week with a beach party and regular worship with our church plant. Click here for Beach Party pictures and enjoy! After a full morning of play, everyone still showed up for a wonderful evening of worship together that night. Then on Sunday we had a Texas dinner party for any and all who wanted to come. Almost 50 people showed up to enjoy hot dogs and hamburgers (cooked inside and not on a grill due to the typhoon coming through our area). Despite the rain, lots of people gathered for a great time of fellowship. There were people from ALL OVER THE WORLD, of course Japan and Texas, as well as China, Korea, Taiwan, Malaysia, Ukraine, and India!!! 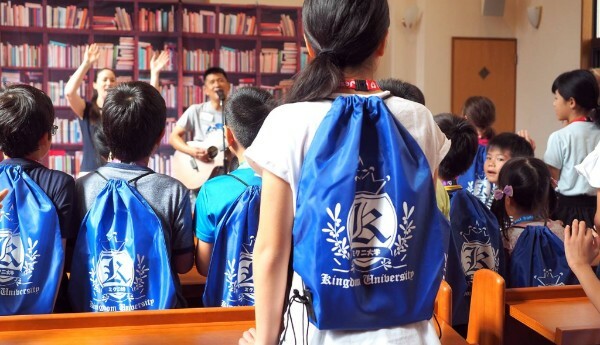 From Monday we prepared all day for Summer School and then over 40 children came to learn at Kingdom University, about who God is, all He created, and what He did to restore all of us from Shame back to a place of Honor in His Kingdom! Click here to see the Summer School picture album and here to enjoy the videos that we produced to share the Gospel over those four days. As usual, after the completion of Summer School on Friday, the core group of BFF headed into the mountains for a weekend of camping. The kids enjoyed hours of freedom and play in water, on the trampoline, searching for bugs, wading in the creek, and enjoying games and friends. We worshiped several times together and Sean Luce brought several incredible messages about the forgiveness we enjoy from the Father, through the story of Prodigal Son. Watch the BFF Facebook page for pictures of Family Camp coming soon. For the first time in years we are enjoying a true break for a couple of weeks at the end of the busy summer (which was preceded by a busy Winter/Spring). It has been years since we have not had another big ministry trip or event immediately following our yearly Summer School and Family Camp. It is the perfect time to work on some projects that get pushed to the back burner, and SLEEP! This week especially is the Obon holiday and all of our church members have gone back to their homes to visit family. All Bible studies and meetings have been dismissed this week and we are truly vegging for the first time in YEARS. Next week regular Bible studies and meetings will be back, and towards the last week of August almost everything will be back in full swing. The Fall semester of After School Klub will launch with the beginning of the fall school semester in September. Pray with us that the Lord will use all the connections that were made through this summer to add to our number and draw more to Himself! We are looking forward to the fall and cooler temperatures! Please pray for the beginning of another homeschool year. Hana begins High School and Kai will be in 4th grade. In addition to that Rocky dreams of actually getting into the studio again this fall! We also appreciate your prayers that those who are a part of our ministry who have yet to fully give their lives to Jesus and follow in believer's baptism, would have the courage to take that next step.